Recent studies have revealed why some dieters do better eating low-carb, while others do better on a low-fat diet. It is because there are two metabolic types: the Hunter and the Farmer. The Hunter/Farmer Diet Solution shows you how to work out what type you are. When you start eating according to your type it will be much easier for you to lose weight and improve your health. This program was created by Dr. Mark Liponis, an expert in preventive medicine and director at Canyon Ranch Health Resorts. Says Liponis, “In terms of dietary needs, there are two basic kinds of people, and they need two different diets. You determine which type you are by undertaking a quiz including questions about physical characteristics, dietary preferences and bloodwork results. Following the dietary recommendations for your type will help you lose weight. It also reduces your risk of developing the diseases associated with each type. Historically farmers grow crops that can be stored for a readily available source of calories. This metabolic type needs to eat frequent small meals and snacks because they are sensitive to insulin. This means they are efficient at absorbing glucose and do well on a high-carbohydrate, low-fat diet. Farmers have an increased susceptibility to cancer, autoimmune disorders and Alzheimer’s disease. Hunters depend on hunting animals or gathering edible plants, fruits and nuts. They are better suited to eating less often, maybe just one or two meals a day. Hunters do best on a low-glycemic diet that emphasizes meat, fish, eggs and low-carb vegetables. While they may crave sugar and other carbohydrates, they experience fatigue if they overdo them. They are more likely to develop diabetes and cardiovascular disease because of a higher degree of insulin resistance. Hunter: salmon, mackerel, sardines, trout, shellfish, buffalo, grass-fed beef, free-range poultry, eggs, dairy products, non-starchy vegetables, berries, pomegranate juice, beans and legumes, nuts, soy, cinnamon, dark chocolate. Farmer: whole grains, bread, pasta, potato, cereals, vegetables, eggs, beans and legumes, fruit, nonfat dairy, fish. Farmers should do aerobic exercise, such as jogging or cycling, after breakfast. It is also beneficial for them to incorporate some strength training into their weekly exercise regime. Hunters benefit from stretching in the morning because they often have tight hamstrings and back pain. Before dinner they should do some kind of aerobic exercise such as running, cycling, swimming, rollerblading. A short walk after dinner can help to improve their digestion. The Hunter/Farmer Diet Solution: Do You Have the Metabolism of a Hunter or a Farmer? Find Out…and Achieve Your Health and Weight-Loss Goals retails at $19.95. Provides different diet plans to suit the two main metabolic types. Includes meal plan suggestions and recipes. Nutritional information is provided for the recipes. Supplement advice is offered to reduce the risk of the diseases linked with each type. Requires elimination of certain foods, depending on whether you are a Hunter or a Farmer. There may be variations within the two types, requiring fine-tuning of the basic dietary recommendations. Does not include a structured meal plan. Exercise recommendations are very general. 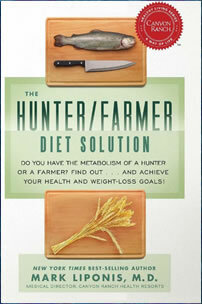 The Hunter Farmer Diet Solution is based on the concept that there are two major metabolic types. This book offers an insight as to why some dieters do better on low-fat diets, while others are more successful eating low-carb.